From what I can tell, they're pretty much identical except the Heath sofa has skinnier arms and more clearance underneath. It's also 4" deeper than the Henry sofa. Because this will be such a big purchase, we plan on making the 4 hour round trip to go look at both of the couches in store to see which one we prefer. We plan on getting the winner in their ink blue performance velvet fabric and I cannot wait! 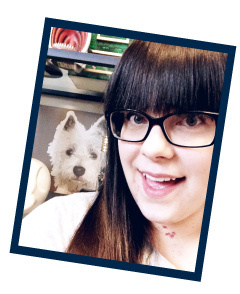 Just for fun, I put together a few mood boards of the living room I'm imagining in my head. The first one includes two Rhys chairs from Anthropologie that I absolutely LOVE but would need to win the lottery to afford haha It also includes an industrial coffee table from Urban Outfitters (we could probably make a knock off version of this), and the super popular RANARP lamp from IKEA. Everything else shown is stuff I already own. The layout isn't correct (the couch will face the media center and the chairs will be in front of the larger window) but the overall look is! My style has changed a ton over the years and I'm really loving the look of more masculine rooms. 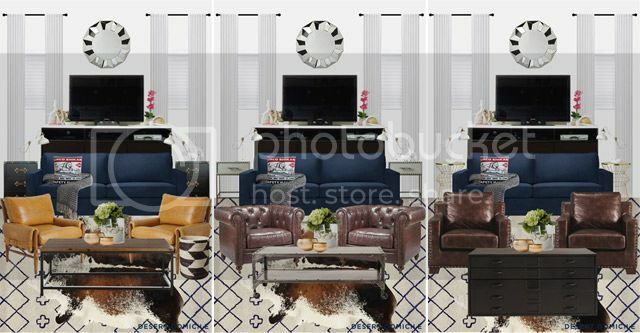 The second mood board includes the same main pieces but I've switched out the Rhys chairs for these more affordable Gordon tufted chairs which are a pretty decent knock off of Restoration Hardware's Kensington leather chairs. I also replaced the first coffee table with this antique finished coffee table from West Elm. It's gorgeous but it's also very expensive. Fun fact: I have champagne taste on a really crappy beer budget haha Anyway, the end tables are actually night stands and are also from, wait for it, West Elm! It includes the chair version of the leather couch option I showed on Monday. I like how the lines of the chair are nearly identical to the lines of the couch and I love the nailhead trim! It also includes World Market's Harley coffee table and Target's Threshold wire side tables. 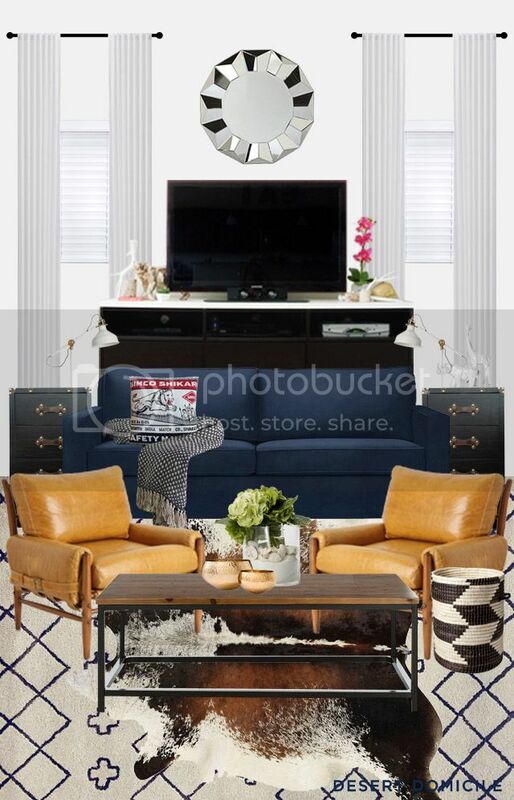 None of the items shown are set in stone but I'd really like to end up with a living room that has the same aesthetic! Which living room do you prefer? Definitely the first one. The camel colored chairs make it so warm! Where is the basket in the first mood board from? It's from Target's fall collection last year! I know that doesn't help you much since they don't carry it anymore but maybe you could find a similar one on eBay? Love love love. The first one is totally you! 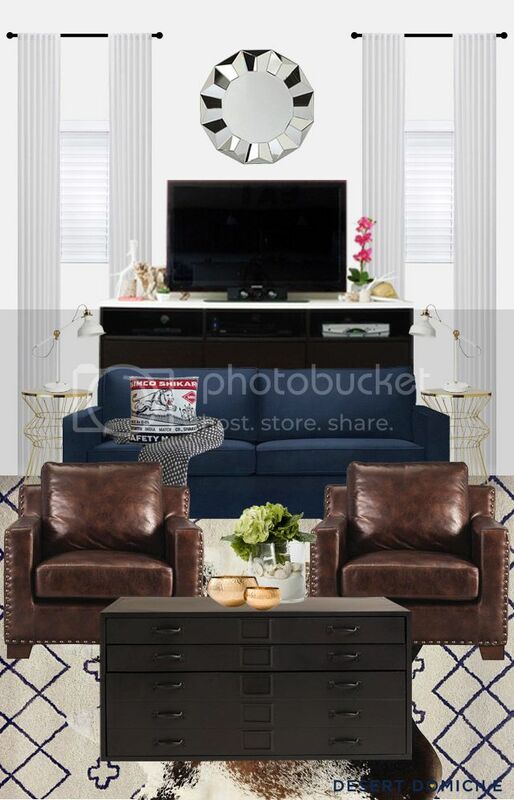 How about putting the gorgeous leather tufted chairs in the first one for affordability? Ditto on the first option. The camel color with the dark blue is great together. I think you need to hunt down some affordable camel chair options. The first coffee table is also my fav of the three. I plan on hunting for something similar because I'll never be able to afford those chairs unless I win the lottery haha Isn't that coffee table great? Nice clean lines with an industrial flair always makes me happy! i'm also voting for the first option! it flows so nice! First or third. I love masculine rooms too and find myself loving "man cave" type rooms more than girly rooms. Give me leather, wood and metal any day! Btw, I've seen many blogs lately that are making the coffee table from the first one. Good luck deciding! First one, for sure. Love the mustard yellow! Isn't it great? It's the perfect shade of yellow in my opinion! K, LOVE the Heath. Those legs are to die for. And I like the yellow chairs. So much fun! both of those couches are beautiful! I love #3, but with the coffee table with #1 - sorry, I always have to go colouring outside the lines! I think we all need those chairs in our life! They're so beautiful and I bet the leather is super soft! Something to consider with the sofas, a little extra floor clearance can come in very handy. My cats favorite place to hang out is under the sofa and, even with dogs, they will shove things under it and it's nice to have the room to squeeze your arm under rather than getting a yard stick every time. And I just love those little legs. 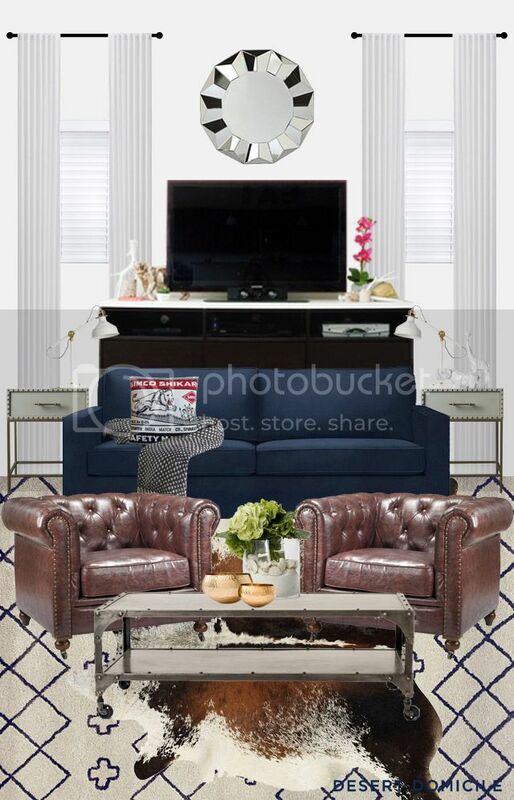 I kinda like the second option.. Love those style leather chairs. All your options look good tho. Thanks John! I like those chairs too because they're similar to the Chesterfield sofa we have in our loft. A little continuity between the upstairs and downstairs would be nice. ooh, yeah, I have to vote #1, too...those chairs! why do pretty things have to cost money?! Haha I have no idea Gretchen! Thing about how many things you'd have if they didn't cost money though! I'd be living in my backyard because our house would be filled to the brim with pretty things! I love option #2 with the chairs from 1 or 2. I love the balance of light and dark and mix of industrial with those cozy chairs. I'm coming over. To sit in all of your chairs and couches. Seriously. I could have a sleepover on those. I loved the anthro chairs and I didn't even click over because I don't want to know how much they cost lol. I love #1. I also have champagne taste on a beer budget! I prefer #1. #3 is too dark and heavy and dont really care the chunkiness of the chairs in #2. You might want to search for some vintage danish modern chairs to try and replicate those very expensive chairs...they could easily and affordably be reupholstered to look just like those. Good luck. I would recommend calling the store before you go. West Elm stores do not have all their furniture that they sell out on the floor. It's happened to me before with a client; they didn't have all of the sofas that we were looking at. They should have the Henry as it is one of their most popular couches, but I have not seen the Heath in stores before. The Crosby also has similar legs and is comfy. So I would recommend you call before you go. Yeah, I love the first one. The chairs add a lot to it! I like the first one. The yellow chairs really make the whole room pop! I am thinking that number 2 and 3 would work better if you accented with yellow/gold pillows, throw, etc. Now that I see the Henry next to the Heath, I love the Henry more. I am glad you went with that one. I looked at your Heath link and because it was a chair, I really liked it, but seeing it as a sofa, I think Henry has better curves. Oh oh oh hands down the first caramel leather chairs. Whatever you do. Those caramel leather chairs HAVE to be in that living room. Oh are they gorgeous.